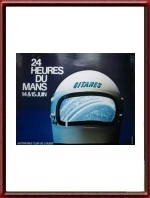 Vintage Original 1975 24 Hours of Le Mans Poster. June 14 & 15, 1975. A VERY scarce poster due to its unusual size and in this condition. The 1975 poster was the start of a new era in Le Mans posters which ran from 1975 to 1980 and is symbolized by "Early Sponsorship and Advertising" where actual advertising appeared on the posters. 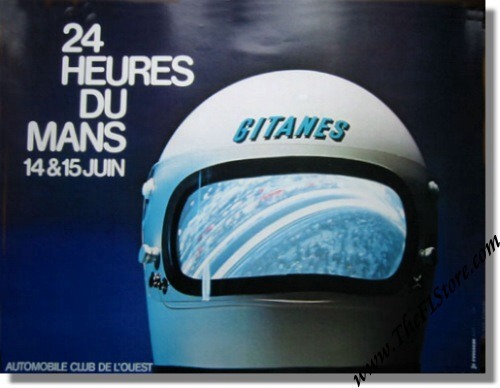 The advertising (in this case French cigarette brand Gitanes) stands out in the symbol of safety represented by the helmet in which the terraces in front of the main grandstands are reflected. Although striking from a marketing point of view, the poster lacks an essential piece of information... the year! The poster is based on a touched-up color photo by Schwager while the production was in hands of Rousseau. The race was won by Jackie Ickx and Derek Bell in their Nr 11 Gulf Mirage Gr. 8 with a total of 336 laps to their name. For the full results of this race, please see 24 Heures du Mans results 1975. Read more on our shipping options HERE.